5/32: Amazing snorkelling right in front of the house. 24/32: Views of the Caribbean Sea from your deck. Are you ready for your West Bay Beach dream vacation? Do you like to be right in the middle of it all? Mere footsteps to the surf and sand in one direction. Some of the island’s most storied restaurants and beach-side bars all within walking distance in the other. All tucked away on a shady, sandy lane creating the feeling of privacy while still having the pinnacle of island life at your fingertips. Casa Tortuga is a tall, cool glass of lemonade, with its unmistakable bright island yellow paint job on the outside, and icy blues of the ocean deep within, this modern construction, built in late 2012, is literally 30 paces from the water of the world-famous West Bay Beach. But with it’s two bedrooms, an open-air dining deck and private rooftop deck stacked on top, Casa Tortuga offers the peace and privacy of an upstairs unit coupled with simply stunning ocean views AND everywhere in West Bay Beach that you want to be right outside your door. Bed down in the queen size master bedroom, tastefully apportioned with a private bath featuring a dual-sink countertop and oversize shower. Your guest room can be configured as a single king-size bed, or dual twin-size beds for the kids, with its own private bathroom to boot. The living spaces and kitchen feature vaulted ceilings, granite countertops, stainless steel appliances, TV, A/C, WiFi—all the comforts of home—coupled with modern furniture and an under-sea decor motif that has to be seen to be believed. Whether dancing the night away at one of Roatan’s many bars and nightspots, or star gazing upon the millions of galaxies lighting up the night sky from your private rooftop lookout, Casa Tortuga does it all, and does it all well. 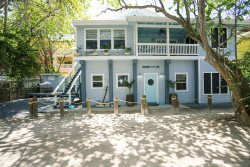 Call us today to book your West Bay Beach getaway at Casa Tortuga. All of the staff members we encountered were very friendly and helpful. Julio was very attentive and accommodating. Francisco the security guard was also very helpful and friendly. The only suggestions I have for the home are to upgrade the mattress in the master bedroom. Also, one dish towel and one bath towel per person is not enough for a week-long stay. Housekeeping services are highly recommended at least once during the week. Fernando is excellent to deal with. He addressed the few concerns we had very efficiently. The rest of the island house team were great as always. The property is great and the recent changes in furniture and paint look great. Our concerns with the recent changes are the surveillance camera. This is very offensive and guests are not made aware of it before booking. We unplugged the camera as we did not to be monitored in that fashion. The addition of the nest smoke and carbon monoxide detector may sound good in principle but when it malfunctions and alarms at midnight we questioned why you would require this technology. The guests have no ability to stop the alarm and no instructions are available. Given the unpredictability of the power grid on the island, this will continue to cause grief to guests. The $1000.00 damage deposit is a bit excessive given some of the other properties do not collect the deposit at all. Fortunately the proximity of this property to the beach and the friendliness of the village will ensure a stay in West bay village will be very enjoyable. Response to emails prior to booking was quick. Check-in was friendly and thorough. Assistance with transportation was great. Check out was easy and friendly. Our stay at the West Bay Village property was excellent. The location for us was perfect. The house was clean and up to date and well stocked. Everything was as advertised. This property is an amazing value! REPLY: Thank you very much, we're happy you found the house enjoyable. Please come back and visit soon. Everyone was very helpful and nice. the property was excellent. Clean, stocked, A/C was excellent, comfortable beds, I cant think of a thing I would change. It was a great trip we will surely do again. Take care REPLY: We are happy you enjoyed the home, thank you very much! Everything was superb. The house is amazing and the beach is beautiful !! REPLY: Thank you so much, we hope to have you back! We absolutely love the place! It's quickly become our favorite of all the places we've stayed in the many times we've come to the island. There is not a thing that we need that is not already provided. The only thing in need of a bit of adjustment is the refrigerator door. It appears to be rubbing on the bottom and you must make sure it is closed good. Not really a big deal at all and likely an easy fix. We surely hope that you continue to have the house available for rent because we will surely be back next year and would very much like to stay here again. Thanks for everything. Beautiful home. RESPONSE: We are happy you enjoyed yourselves and Tortuga Beach House. Also appreciated are your comments on the fridge, we will have our maintenance staff address that promptly. Your team members are awesome! From the beginning they have been great! We had a great time. The house has everything you would need to stay for a week. Thank you for the goodies in the refrigerator on our arrival. In my opinion you are just missing the power sourde for when there is no energy supply in the island. REPLY: Thank you for your kind review. We are currently working on finding a backup power solution for all the homes in this area. Hopefully it will be in place for your next visit! Brad, Ruth and all the rest of the team are the best! Always friendly and there to answer any questions. They go out of their way to make sure you are having a great time and that you are comfortable in your stay. And Brad is always happy to play a round of golf with you. REPLY: Thanks, Janna! We are always happy to have you back with us. And yes, always looking for a good excuse to get on the golf course! We appreciate the comments on the house and will pass them along to the owner. Have a great summer, look forward to seeing you next time! We love Roatan and all the wonderful staff at Island House. West Bay Village is our favorite location,beautifully beach,accommodations are excellent and locals are very friendly. We always make new friends with the other people staying in the other houses. Its fun comparing trips and diving experiences. Looking forward to our next trip to this island paradise. The staff at island House truly enhance your stay in Roatan, and elevate it to a level that you cannot imagine, until you experience it. West Bay Beach is heavenly on its' own, yet the people here can, and Do, make it better. In every way, we felt welcomed, and they not only solved any problem we had, but were there to offer help with airport transportation,and anything else we may need, with quick, kind responses to all emails, before our arrival. (DO plan to stop at Eldon's grocery after you arrive at the airport, which I highly suggest; you can pre-book this with IH, via email,and the price is very reasonable. We felt immediately secure enough to leave our basic baggage with the driver, and both go in to shop the store) Further, they helped us print boarding passes,gave us free local maps and suggestions, and more. Their customer service level is consistently at 110%! If you like wonderful attitudes and warm smiles, with an eye on enhancing your vacation, then you will love the team at Island House, as much as we did. Our heartfelt thanks to Shanna, Ryan, and the entire staff at Island House, for making our vacation perfect. I am searching for a new adjective, as "wonderful" and "amazing" just do not do Tortuga condo, and the Island House staff, justice!. The beach is literally 18 steps from the unit, and with a complete, and well stocked kitchen (paper towels, coffee filters, dish soap, and more), it is so easy to prepare drinks and snacks for enjoying on the beach, or a full meal at any time. We two women felt very safe and secure at all times; there are two guards who each do a 12 hour walking shift,and they are wonderful, helpful young men; they always greeted us, and let us know they were there for us. The condo was built recently with all of the best finishes, from beautiful, cool tile floors,Honduran wood cabinets,and accent tiles in the bathrooms, to the comfortable decor, fans, and great air conditioning units, that keep the entire unit cool. We could turn off the main unit in the den, and open the windows, for a morning breeze, as the windows have screens. Breakfast on the patio is a wonderful way to start your day; there is a large table with comfortable chairs and a great ceiling fan there, as well. The partial ocean view through the swaying palms, with the sounds of the morning birds, start your day perfectly, and it just gets better, from there. The beds are comfortable, and the bedding is good quality, and very soft. Plenty of nice, large towels, wash cloths, and hand towels provided in the spacious bathrooms, and they even supply plush beach towels and a sarong. I have honestly never stayed in a condo this well stocked, in my many years of renting from "by owner" sites. The closets are large, and there are plenty of hangers in each one. A hair dryer is provided,too. Anything that we thought we might need, we would find, tucked into a drawer or cabinet. Shanna decided our tv was not working to her high standards, and had a gentleman carry in a new one, and connect it, before we even unpacked; there are plenty of good channels, in English and Spanish, and the wifi signal was included, and worked well in all areas. Conveniently, there is a key lock box outside the condo door, with a combination,and you can leave a key there at all times, so it is handy when needed, yet you don't need to worry about losing a key at the beach, and your things stay secure inside the condo; there is also a small safe for your use; it is easy to navigate and works well. The condo is located in the center of everything in West Bay, and we met others staying there, and enjoyed getting to know them. Staying here is like life in your own village, with everything you might need, at your fingertips. Book with the confidence that your comfort, convenience, and everything you need for a relaxing, restorative vacation, is here! Island House Resort management staff are very helpful and responsive. Beautiful view of the sea from upstairs balcony and clean, excellent interior This upstairs apartment is clean, modern, well-maintained two-bedroom, two bathrooms with kitchen plates, cutlery, and equipment, and best of all, the view from the balcony where there is a large table and 5 chairs is wonderful. There is only one house between this house and the beach right in front of West Bay Village, which means one avoids direct wind and sun, but you see the blue water in a frame of tree leaves. You can walk to the water in two minutes and walking left for the distance of a block takes you to the end of West Bay beach, where you can walk into the water and begin snorkeling immediately above the very near coral beds and many colorful fish. You can also make it out to the Wall from this beach. You can't go wrong with the rental. Island House are very good about taking care of your every need! Great deck, nice home, close to the beach This was our third stay in WBV first time at Tortuga House. There were four of us, two couples. We loved the deck and spent a lot of time out there in the evenings. The house is located about 15-20 steps from the beach. The bedrooms and bathrooms are both nice size and connected to each other. The house has everything you need for a relaxing vacation. We normally have never had any issues with the other rentals but we found two suggestions for the future renters and gave our recommendations to the property managers when we left. One was that the steps up to the house are very slippery when wet (husband fell and hurt his ribs the first day) and there should be a throw rug by the deck door leading into the house as this area can get be very slippery at times too due to the tile. We are quite sure both will be taken care of as Island House are very good about taking care of your every need! We wouldn't hesitate to rent this home again and love the staff at Island House! The people that are in charge of this house are very attentive, helpful, and were very good at recommending things and places as this was our first time to Roatan. Beautiful beach house, excellent location We LOVED the Tortuga House, it was everything and more than what we expected. We stayed here with another couple, and both had beautiful rooms and ensuites. The location is fantastic, and the village of homes is very quaint and beautiful. The beautiful beach is right there!There is security and it is gated. Would we return - absolutely! I would recommend this house to anybody, it was a fantastic holiday, and we would return right here the next time we come to Roatan. Enjoyable Time to Reunite With Family I arrived from the West and my cousin arrived from the East, together we met at Roatan after not seeing each other for many years. Torgtuga gave us a 'home away from home' atmosphere. This new beach house includes numerous indoor amenities to make a relaxing holiday perfect (including an awesome housekeeper). Outdoor amenities include 24 hour security, groundskeepers and being steps from the world famous West Bay Beach. A pre-arranged driver was arranged for an airport pick up. With the help of the driver, groceries were purchased at a local supermarket. However, nightly supper was at one of many West Bay or West End restaurants/bars. Snorkelling on the reef right off the beach was incredible! The coral is so alive with colour and varieties of fish abundant. This property is vary spacious and CLEAN! The property management staff were so helpful - it was great to have them as a local resource! Amazing Beach House My family of 4 (2 kids) stayed at Tortuga the last week of August - and thought it was a fantastic place to stay in West Bay! The property was clean, nicely decorated and well maintained. My kids fought daily over the walk-in shower in the 2nd bedroom. I had initially thought the tile floors throughout was a little odd - but after our first day in the water I realized the tile was a huge benefit - especially with kids! It's only a few steps to the best beach on Roatan - beautiful sand and only a short swim out to the reef. There are lots of restaurants in easy walking distance of West Bay Village - and a small shopping center nearby with a coffee/wine bar, small grocery, ATM and souvenir shop. The water taxi dock is also very close. We only got to enjoy the deck a little bit due to the hot temperatures - but it was great spot to set out our beach gear, and has amazing views of the water! Prices are based on 4 person occupancy. Additional persons, up to 6 total, may be accommodated for $25/person/night. Security deposit $1000 is required. 20% off 30 night stay or more.